Printed in 1997, Indianapolis Memories: Festivals Cookbook is a collection of recipes from Indianapolis’ most popular community festivals, ranging from a month-long extravaganza honoring a world-class sporting event to one-day celebrations of food and fun. Numerous ethnic festivals add a richness and diversity to the mix that one might not expect in such a solidly Midwestern city. 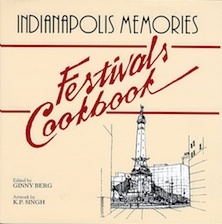 It features recipes from fourteen of Indianapolis’ most popular festivals, including the 500 Festival, Balkan Festival, Italian Street Festival, Strawberry Festival, Midsummer Fest, Indiana Black Expo’s Summer Celebration, Oktoberfest, Greek Festival, Penrod Arts Fair, Fiesta, Western Festival, Applefest, International Festival, and the Festival of Gingerbread. In addition, K.P. Singh’s illustrations salute some of Indianapolis’ best-known landmarks. Singh’s artwork, which is represented in many prominent public and private collections in more than 25 countries, offers strong visual memories of sites around the Hoosier capital.